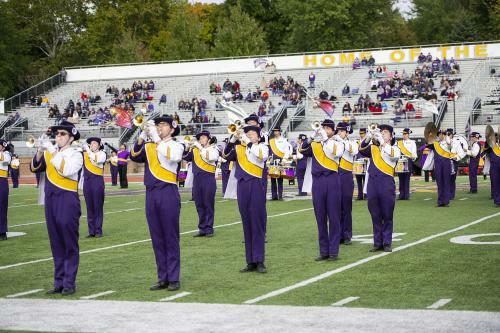 MACOMB, IL – When the Western Illinois University Marching Leathernecks step on the field to perform, they do so with the University's core values woven through their program and the band's 100-plus membership. Associate Professor Matt Thomas is beginning his ninth year leading the Marching Leathernecks as they perform at home football games, select away games, regional parades and tour and perform at high school band competitions as a marching student recruitment team. In addition to the band's musical ventures, many of their performances blend into the University's outreach, recruitment and retention programs by showing students from every academic department they can be a part of this inclusive group. Thomas said about 60-70 percent of the band's members are non-music majors who are just looking to connect with a passion for performing in a marching band. Thirty-eight of WIU's academic programs are represented through the student members of the band. Students come from 61 different high schools from Illinois and other adjoining states. "We are at every SOAR event, which has helped keep our membership stable," said Thomas. "Many times we meet with students and they say joining the band hadn't crossed their mind." 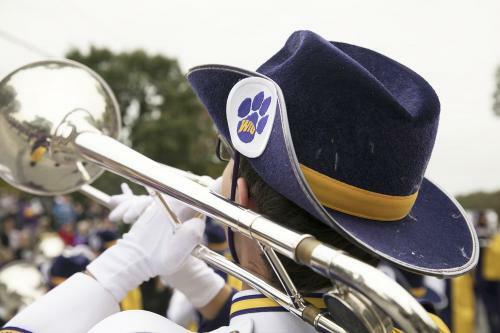 The annual Marching Band Classic on the WIU campus attracts 30 high school bands from around the region and state and brings 3,000-4,000 visitors to campus. This year's event, the 37th, is Oct. 20 on Hanson Field. Another aspect of the band is the inclusive nature of membership, which has grown over the past several semesters to include a student who is legally blind and another in a wheelchair who performed with the band's color guard. "We found an adjustable size flag pole and she was on the sideline for the halftime show," said Thomas. "A graduate assistant pushed her wheelchair in the parades." The student who is legally blind is able to see shapes and follows the band members around him during the shows. 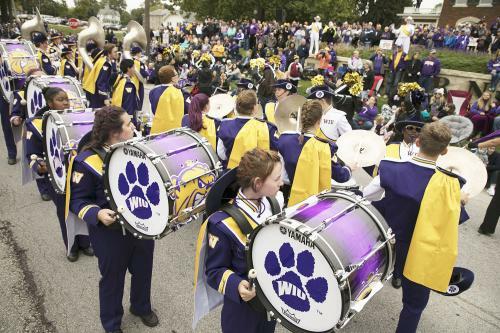 Community outreach is another important part of the Marching Leathernecks, which performs shows for local retirement communities and during campus events, and fundraising walks in the area. 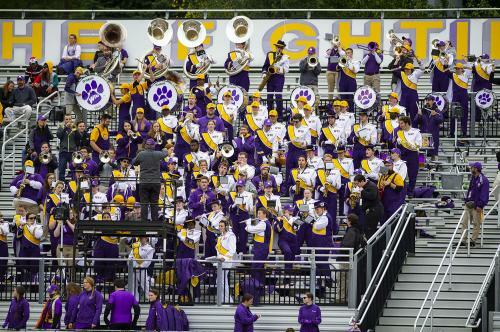 Thomas said the WIU band also often visits high schools in the area to play combined performances during each school's half-time show. Over the years, Thomas said the band's membership numbers have stayed steady and he feels campus support for the Marching Leathernecks has increased. "I feel like the University community and the administration have recognized more and more the impact of the marching band," he said. "A band is a symbol of the health and well-being of the University. We've seen a recognition and the importance and vitality of our organization." Maddy Garrott, one of the Marching Leathernecks' three drum majors, said her band experience has not only provided her with another family, "but with a group of people who have the same passion for music I do." "Being in the marching band at Western has given me so many opportunities to make lifetime friends and have an amazing experience with other people from all majors," said Garrott, of East Peoria, IL. "The marching band has given me amazing roles in leadership, starting off as section leader for flutes and piccolos my sophomore year, and currently serving as a drum major this year." 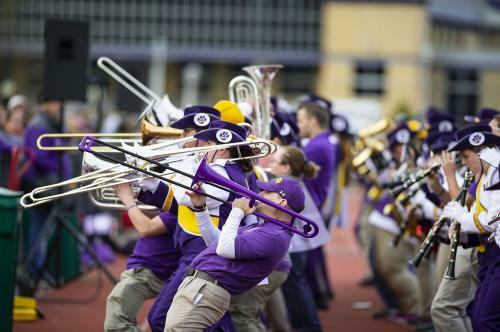 Garrott, a junior music education major, of East Peoria, IL, added that the University's marching band is a "group of insanely talented people who go out of their way to make music for people at football games and other events." "As a student, being in the marching band here at Western, gives me the sense of belonging to a group that not only loves music as much as I do, but that can band together and work hard to create something beautiful to show the community," she said. Senior biology major Mariah Dicksen, of Lockport, IL, said the marching band has made a huge impact on her college experience. "At first, I joined because I did it in high school and enjoyed it," she said. "I didn't realize that I would be embraced by such an incredible organization. Marching band is like a family and it truly helps with any homesickness or worries about forming relationships. It allows students to gain invaluable leadership skills." Dicksen said she has enjoyed setting a leadership example for the band's new members. "I have developed so much as a leader since becoming the captain of the color guard," she said. "You learn how to manage your time. It is true that marching band takes a lot of time and practice. If you are passionate about the program, you find time to fit everything into your daily schedule. A lot of the skills that I have developed through marching band translate to my overall college experience." Thomas was also instrumental in bringing the two-time world champion Phantom Regiment Drum & Bugle Corps to WIU for its training camp in Summer 2018. The 150-member corps is made up of men and women, ages 17-21, from across the country. The corps' members and about 50 staff lived in WIU residence halls and practiced on Hanson Field, Vince Grady Field and the Marching Leathernecks practice field west of Olson Hall. The training came in advance of the corps' annual competition tour. Thomas met Corps Director Rick Valenzuela while judging a marching band competition together. He said the hope is to have the Rockford, IL-based corps return to Macomb to train. "They want to come back; we're just working on logistics now," said Thomas. "They were so impressed with how well they were treated here and they felt that everywhere." For more information about the Marching Leathernecks, visit bit.ly/2yhRqVo.